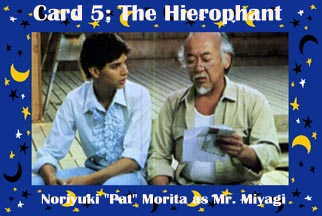 Mr. Miyagi teaches his student. The Hierophant is the Teacher, the Guru, the possessor of mystical knowledge that you will be darned lucky to be deemed worthy enough to receive. And if you do receive it, you're probably not bright enough or spiritual enough to understand what it means anyway. If you want to get it, plan to work hard.